THE National Capital District will host three pool matches of the Rugby League World Cup 2017 (RLWC2017). The announcement was made yesterday at the Official Tournament Draw. Rugby League fans of Papua New Guinea will get the opportunity to experience the pinnacle of the international game when Port Moresby (venue yet to be announced) hosts the PNG Kumuls three pool matches in the RLWC2017. The Kumuls will face a European Qualifier on both Saturday 28 October and Sunday 5 November, followed by an entertaining encounter against the USA Hawks on Sunday 12 November 2017. 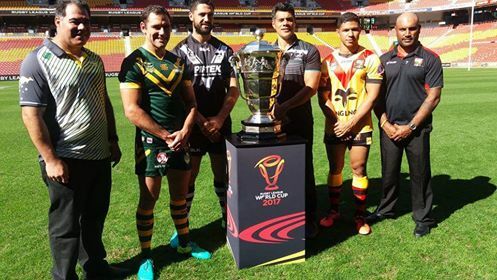 RLWC2017 Chief Executive Officer, Michael Brown, said the support of the Papua New Guinea Government and the City of Port Moresby has ensured that Rugby League fans of PNG will have access to the World Cup. “Rugby League is the national sport in Papua New Guinea and we know the country’s passionate Rugby League fans will embrace hosting the sport’s pinnacle event.” “In planning this Tournament, the Organising Committee made a deliberate decision to take the Rugby League World Cup to more fans than any World Cup has done before. In October 2015, the RLWC 2017 Organising Committee confirmed Papua New Guinea would host the Kumuls three pool matches to make the World Cup accessible to more people than ever and further support the growth of Rugby League throughout the region. The RLWC2017 will see 14 teams play 28 games over five weeks from 27 October until 2 December 2017 – all hoping to be crowned world champions. With 11 teams already confirmed, the final three teams will come from the European Qualifying Tournament to be played in October and November this year. The teams who are still in the race include Wales, Ireland, Russia, Serbia, Italy and Spain.